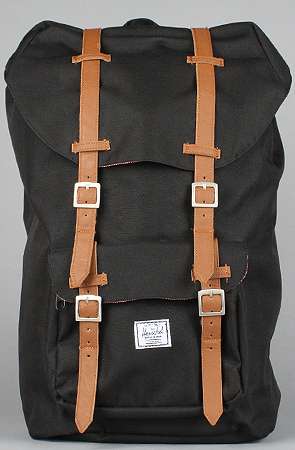 The Little America Bag from Herschel Supply is one backpack that’s large on style. It features double buckle trim, a drawstring top, a flap with a magnetic snap closure, a single external pocket with flap closure, signature lining, padded back, padded shoulder straps, and internal padded laptop sleeve. It measures a not-so-little 20″ H x 10″ W x 5″ D.
Add a little super style to your formal wear with the Superhero Stamp Cuff Links. 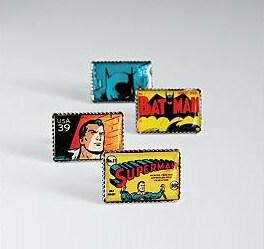 These super cufflinks are made from actual U.S. postage stamps sealed in an epoxy coating. Choose from either Batman or Superman. The Batman ones combine the 1940 Batman #1 cover with him saving the day, while the Superman ones combine the 1941 Superman #11 cover with Clark Kent jumping into action! 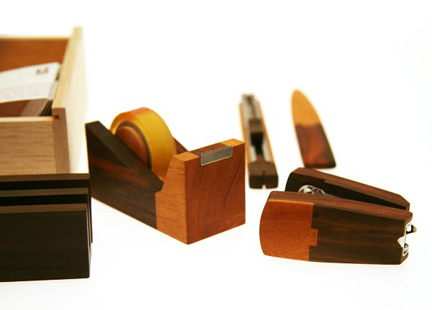 Make your desk cool and sharp with the Wooden Stationery Desk Set. This unique wood desk set comes arranged in a wooden box with a tape dispenser, stapler, envelope opener, and pen/card/envelope holder. Designed by Singgih Kartono and handmade with naturally harvested mahogany and sonokeling wood in an Indonesian village, this set will will add some freshness to a boring desk. 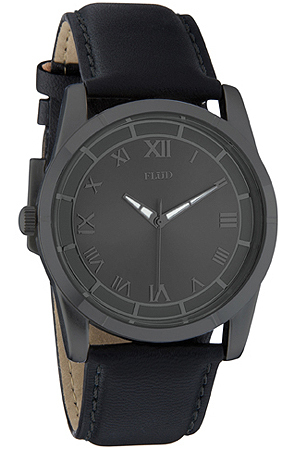 The Moment Watch (in Gun Metal) from Flud Watches is one sleek and sharp timepiece. It’s an analog watch with applied Roman numerals, hour markers, interchangeable mesh, and interchangeable leather bands. The gun metal color gives a clean, smooth, and slick allure to this watch. 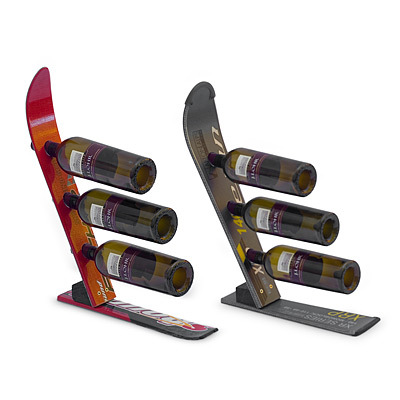 Looks great with casual, work, or formal wear. 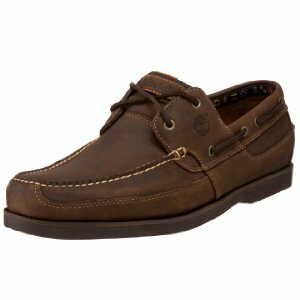 The Kiawah Bay 2 Boat Shoes from Timberland are a sturdy and comfortable pair of casual shoes. They have leather uppers, rubber soles, 3/4 length EVA heel cups, a rawhide lacing system, and durable siped and scuppered thermo-rubber outsoles. Great footwear whether you’re on a boat, street, bus, or just the patio. Scare your neighbors and the local kids with your own Garden Zombie. Stick this guy in your garden for some ghoulish fun and decor. Hell, you can stick him in the hallway or patio for unsuspecting guests. 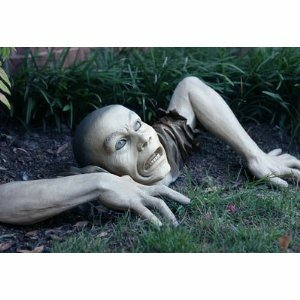 This zombie is an incredibly detailed lifesize resin sculpture with half his body seemingly crawling up through the ground. This is perfect for addition to your lawn for Halloween, or any time of the year for that matter! Carry your camera in style with the Region Small Camera Case from Fossil. 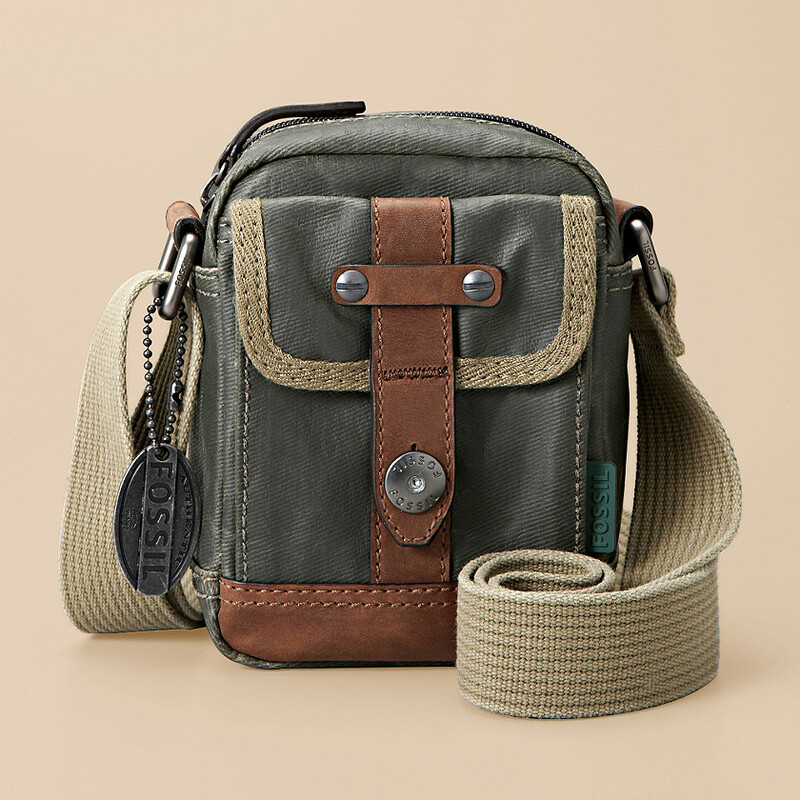 This camera bag comes in a handsome dark green, has an easy top zip closure, and made of coated twill. It also has a front-flap pocket with magnetic snap, a long shoulder strap, and has a faux suede lined interior. This bag will look great, while protecting and storing your camera on your next short excursion or a long vacation. 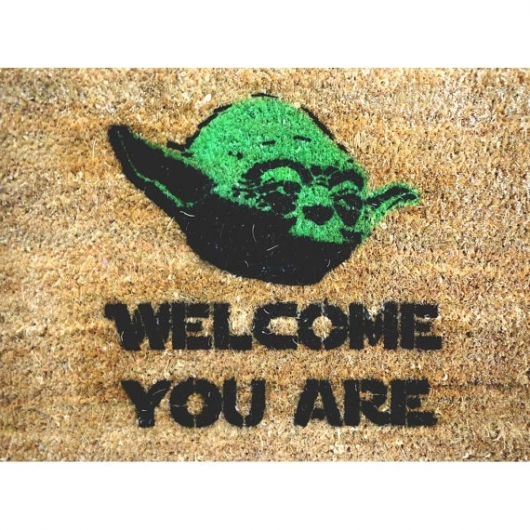 Invite Star War fans, Wookies, Ewoks, and Jedi into your home with the Star Wars Yoda Doormat. This 100% coconut fiber doormat has a latex backing to keep it firmly in place, is hand stenciled, and pressure sprayed. The welcome message is said the way only Master Yoda can say. As the message says, everyone is welcome…well that is unless you’re a Sith Lord, Stormtrooper, or William Shatner! 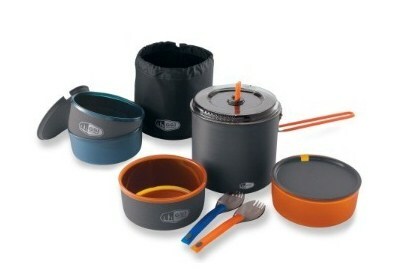 Forget the chips and dip for your next poker party. Jazz it up with some better food. The Perfect Bite Co. Poker Party Sampler will sure to wet the appetite of all your poker buddies. This sampler includes 48 total hors d’oeuvres. 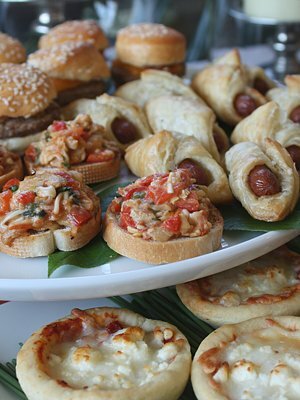 There’s 12 each of the following: bacon cheddar mini-burgers, artichoke & red pepper crostini, sundried tomato & goat cheese mini-pizzas, and mini haute dogs en croute.